Earlier today, in the middle of a perfectly beautiful spring afternoon, we put Crash the cat to sleep. 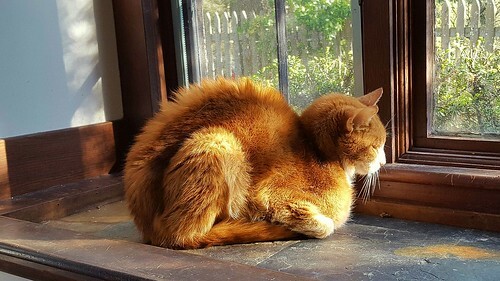 Like Bunny, whom we’d euthanized in January, Crash was 17 years old–a ripe age in cat years–and had been hale and healthy until he noticeably wasn’t. Whereas we’d tried to slow Bunny’s decline from kidney disease with a several-day-long hospitalization in the veterinary critical care unit that bought her only a few more weeks of quality time, we opted to keep Crash at home until the end, recognizing the signs of terminal kidney failure and opting for palliative care instead of extraordinary measures. 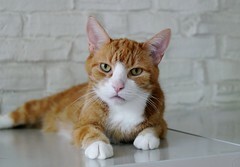 Each of our cats has his or her own personality, and Crash’s was the most irrepressible. He should have been named “Houdini” for his proclivity for squeezing into places he didn’t belong: if there was a door ajar anywhere in the house, Crash was there in a flash to squeeze his way through it, perpetually curious about life on the other side. Crash was never much of a lap-cat; he was too active and athletic for that. 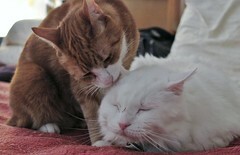 Although he wasn’t one to sit in your lap and allow himself to be petted, he did enjoy grooming the other cats, licking their heads and necks–the spots they couldn’t easily clean themselves–with an attention that suggested he’d been a hairdresser in a previous life. Crash had an impish personality: he was a perpetual teenager, long in leg and mischievous in attitude. When Reggie started to struggle with stairs, Crash would torment him at every step, pouncing on Reggie’s tail and batting the fur on his hind legs, a playful brat who loved to harass his elders. After I took to carrying Reggie up the stairs, Crash mellowed and began hanging out with Reggie as he lay in whatever spot I’d arranged him, too feeble to stand. 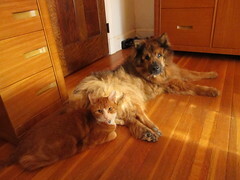 One of my favorite pictures of the two of them shows Crash keeping Reggie company as he rested in a square of morning light, their similarly colored fur aglow. There is, I’ve found, a strange sort of quiet calm that descends upon the house after one of the pets has died: Crash is the seventh pet we’ve lost since March, 2015, so I’ve come to know the drill. When you arrive home after euthanizing a pet, the house seems large and unnaturally quiet. Regardless of how large the animal was in life, in death his absence looms huge: an elephant that has left the room. I think this oversized sense of emptiness arises because of how much care a dying pet requires. When a pet is dying, part of your mind is always devoted to him: is he fed, watered, and otherwise well-tended, and is there anything else (anything!) you can do to make him comfortable? When you come home after euthanizing a pet, there is a brief sense of shock when you realize there’s no longer anyone to fret over. You can put the IV stand with its bag of intravenous fluids away, wash the dish that had held the syringes full of medicine, and tidy up the sloven corners where your now-dead pet had been accustomed to nap. The pillows upon which Crash had rested these past few days are in the wash now; soon enough, after the initial novelty has subsided, the remaining pets will reclaim them. Nature abhors a vacuum, and a house full of pets doesn’t stay calm and quiet for long, the remaining pets with their remaining lives expanding to fill the emptiness left by one of their own reaching the end of his ninth. Beautiful tribute. I’m sorry for your loss. Aw, so sorry for your loss, but your story about Crash’s life and decline is a beautiful tribute. Wow. You must keep a lot of pets to have lost that many in such a short time. I remember when dear Reggie went over the rainbow bridge. Unfortunately, his love of outdoors was his detriment as someone hit him hard across his back, causing a severe injury that caused him terrible suffering and death a couple of days later. Awful news. Sincerest condolences. May all your pets know the happiness that comes with sitting in a good, strong sunbeam. Beautiful! Sorry for your loss. So well written and the sense of loss is so profound. I’m so sorry for your loss. I’m sorry to hear about Crash. Your comments about the way the house feels after the death of a pet are so true. Caring for a dying pet requires such a large amount of mental and emotional investment. When they die there’s a sense of sadness and loss but also a relief — at least, that’s how I’ve experienced it.